With the release of the iPhone X, Apple took the smartphone world by storm. As such, many manufacturers have taken note and produced a number of Android phones similar to the iPhone X. The list of Android phones similar to the iPhone X continues to grow – largely due to contributions from Chinese companies. While there are a number of Chinese manufacturers that produce their own high-end flagships, there’s a large market for knock-off devices that retain the look of luxury phones at much more affordable prices. As such, there are already a huge amount of Android phones similar to the iPhone X, many of which were posted in an image from Allen He on twitter. As you can see, these Android phones similar to the iPhone X bear a striking resemblance to the recent flagship from Apple. It’s clear that the company has made a large impression on the smartphone scene, although the majority of these Android phones similar to the iPhone X take from the phone in design mainly rather than features. To this day, the FaceID feature from the iPhone X is pretty unique. While the iPhone X is far from the only phone to experiment with facial recognition technology, they were the first to implement it in a consumer device on such a successful scale. While Apple hasn’t always led the charge when it comes to new technology, this is an example of an innovation that monopolized the holiday market and led to the fastest selling iPhone in history. By implementing a unique scanner that can take into account changes in appearance – such as the growth of facial hair or a new pair of glasses – Apple managed to create a product that “just plain worked,” making unlocking your phone both secure and convenient. 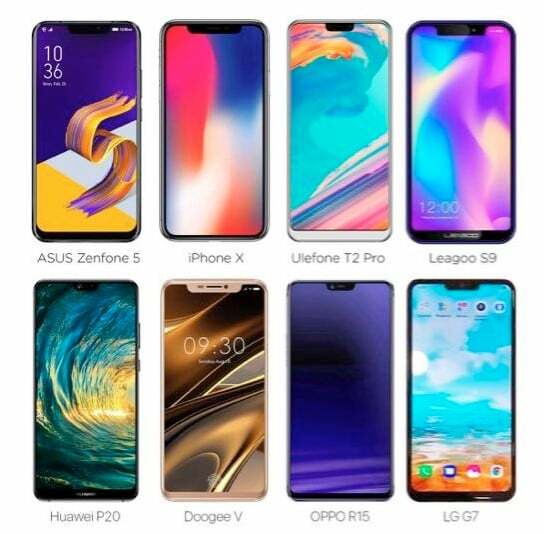 This is not at all the first time that Asian manufacturers have taken inspiration from Apple with Android phones similar to the iPhone X, and these models are likely to see great success in the country – an area where knockoffs can generally thrive due to the lack of enforcement of copyright law. If you’re outside of that region, it’s likely that you’ll have trouble getting your hands on one of these phones – leaving your options as Apple’s device or an Android manufacturer with a bigger worldwide presence. However, it seems as if more and more Android companies might start following in the footsteps of Apple, with word that Google is currently developing support for a “Notch” feature with Android P. This may be a sign that the Google Pixel 3 will join the lineup of Android phones similar to the iPhone X, which would give us another option from a more recognizable manufacturer that clearly takes inspiration from Apple’s incredibly successful device. It remains to be seen whether the Android phones similar to the iPhone X are jumping in early on a trend that will revolutionize the smartphone world, or if they’re just trying to take advantage of some of the current hype regarding this successful flagship. With the rumors that Google is positioning the Android operating system to take advantage of this new type of design, however, it’s likely that the iPhone X Notch is here to stay – at least for now. We’ll have to see if Apple continues this trend with the release of a trio of phones later this year, or if the Notch is already old news for this smartphone design trailblazer.